ca you give me a hint? When you say that you want to specify a stop city, what are you trying to achieve? Stopping the algorithm when reaching it (to prevent doing more work than necessary), or calculate the route to that specific city? I've written a more complete version which I haven't published yet, but you can take a look at it here: http://hansolav.net/sql/graphs.html#dijkstra. thx for the scripts and the realy fast answer! i see, you use CTE, so SQL-Server have be at least 2005 (we use 2005). my problems are solved. I expanded this code with the CTE from your new script. Now, my "Database-Internal-Navigation" is finished. Good to hear that you solved it. The code shouldn't be much different from what I've written. If you know the destination, you could make it stop when it reaches it as an optimization. Other than that, it should be enough to filter the results from the CTE at the end. Feel free to ask if you have other questions. 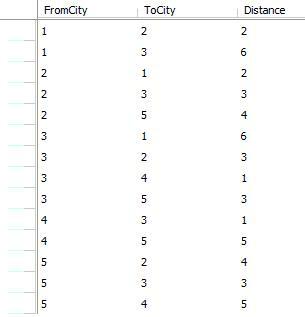 How to calculate the route to the specific city? Thanks. I had to write Dijkstra's in Oracle PL/SQL. I reused the data-structures described here (CityList) and converted T-SQL's UPDATE in to Oracle's MERGE INTO and I was pretty much done. I am a Research scientist working on the same problem. This was a really helpful read. Did you write/optimized this research any further. I would be really obliged if you can share your findings. Apart from that, I haven't done any more work on this. I guess a non-T-SQL implementation would be faster, for instance it could be implemented as SQL CLR (.NET in SQL Server). Just ask if you have any questions. If I'm slow at replying, send me an email at hansolav @ this domain. Good afternoon. Flattery is like cologne water, to be smelt of, not swallowed. Help me! It has to find sites on the: drug addict treatment center. I found only this - <a href="http://design.ru-deluxe.ru/">adobe fotoshop kisti</a>. Thats a good question, to start with we dont provide drug treatment. For alcohol and drug information ncadi. Thank :mad: Paola from Algeria. Good morning. A writer is a person for whom writing is more difficult than it is for other people. Help me! Need information about: Turbo Tax. I found only this - <a href="http://turbo-tax.biz">turbo tax</a>. Long term residential drug and alcohol treatment programs offer around the clock. Participants will be recruited from alcohol treatment centers. Waiting for a reply :cool:, Channing from Austria.